When using a paper folder, I am sure you have run into issues such as jams, misfeeds, and paper not feeding properly. Don't despair, this does happen from time to time on these type of machines. Even in large print and bindery shops, with machines that run in the five and six figure dollar range, they run into these same problems! Generally, a print shop will account for this and do a 5% or 10% overrun on their printing to be on the safe side. This is not a bad practice to employ, even in a small to medium office setting. 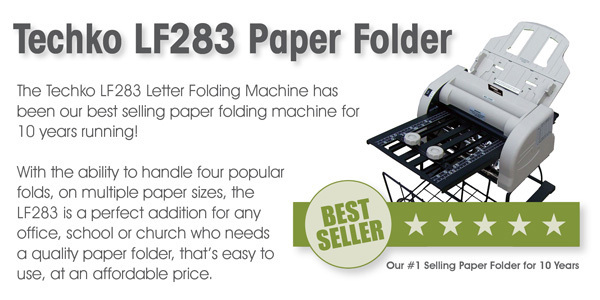 Below is a guide to assist you in trouble shooting your paper folding machine problems. Double check to make sure you have the correct combination of knob settings for your fold. An incorrect fold is often the result of misreading the guide settings that came with the machine. A simply adjustment of the knobs to the correct settings often solves the issue. If you are doing a half fold, many machines require the second paper guide to be turned around. You will need to literally turn the second folding guide around and re-insert the other end (so the closed section if facing in towards the machine). Remember, the 2nd folding guide is the shorter one that goes into the back of the unit. Often people doing half folds forget to do this step, which causes the machine to fold incorrectly. Make sure your fold plates are installed correctly and tightly. If the front and back plates (or one or the other) is not installed correctly onto your paper folder, or if they are not firmly locked into place, you will surely encounter a jam or misfeed! To ensure that the plates are properly installed on your machine, pull them out and reinsert them, making sure to lock them firmly into place. There should be very little "give" if the plates are locked in correctly. Keep in mind, however, that not all machines allow access to the plates. If your machine has enclosed/non-adjustable plates, do NOT tear the machine apart to try to adjust them. Chances are your jams on those type of machines are being caused by something else anyway. Check your machine for left over particles of paper from a previous jam. If your folder is constantly jamming, check the machine and rollers to make sure that there isn't a small particle of paper, left over from a previous jam perhaps, caught in the machine somewhere. Even a small tiny corner of a sheet of paper that is stuck in the machine can cause subsequent jamming issues. Look at the machine thoroughly for left over particles of paper. Take off the front and back plates and look inside them as well. Check the rollers thoroughly. If your machine has a dejamming handle, use it to gently turn your rollers while looking for paper that may have been stuck inside. Try to feed a sheet of paper manually through the machine to see if you can tell where it is getting caught. Check your paper stop knobs to be sure they are straight. Make sure that your paper is not skewing something along the paper folding process. If the paper is not fed straight into the machine, or if the paper stops on the folding machine are not square, this will cause the paper to skew and you will see jams. Look at the knobs on each plate (front and back) and make sure they are square and lined up correctly. Make sure that you have setup the machine correctly. Generally, setting up a paper folder for a new fold is fairly easy, however if you misread the guides or invert the fold plates you will have jams and/or an incorrect fold. Double check your settings before trying to fold a large stack of papers to make sure everything is working okay. For those that have never had experience with using and setting up a paper folder, the initial learning curve can be frustrating, but, I can assure you, with patience and practice, setting up the folder becomes much easier, each time you use it! Make sure your paper is not "curled." Often times, paper that has been printed on a heated source, such as a laser printer or copy machine, will have a slight "curl," as it comes out of the printer or copier, due to the moisture being removed from the paper as it is run through the fuser unit (the part of the machine that fuses the loose toner to the paper via heat). This may not happen on machines that have a straight paper path, but certain models may feed in such a way that the paper is "wrapped" around a roller as it exits the machine, causing it to have a slight "curl" in the sheet. If it is then left to cool down, as is, it may create a permanent curl in the sheet, which can cause problems in a paper folder. To combat this issue, we suggest that items being printed using a heat based machine (this will not apply to ink jet printers) be placed on a flat surface to cool down, with a heavy book (i.e. phonebook) on the stack to help the paper to flatten out as it cools. This should help alleviate jams caused by curled sheets. Make sure there isn't a lot of static electricity in the air or paper. Static electricity can cause sheets of paper to stick together, and double sheets then get pulled into the rollers of a paper folder, causing jams. We see this happen a lot more often in cold and dry climates, in the Winter, or when a paper folder is placed in close proximity to computer equipment. As the sheets are pulled through the folder, more static can build up, causing even more jams. If you feel there is an abundance of static in the air, or on your paper, you may want to try a static killer to combat this, such as Statikil Aerosol Anti-Static Spray. It can be sprayed in the room (carpets, etc. ), near the paper folder, and/or on the edges of the side of the paper that is being fed into the machine. Make sure you are folding recommended materials for your machine. While it may be hard to believe, some consumers have actually tried to use their paper folder to fold plastic, wood, chipboard, cardboard, envelopes and other types of materials not intended to be fed into these type of machines. Paper folders are meant to fold regular bond paper. If you feed unsupported paper and/or foreign objects into the machine, you are likely to not only get a fold, but also damage the machine beyond repair. Another issue many paper folder users have is trying to feed glossy coated stock into a friction fed folder (which most sub $1000 folders are). Friction fed folders will not feed glossy paper correctly. When fed into a friction fed machine, initially the glossy paper may seem to work correctly, but as friction builds up on the paper, static is produced, causing the glossy sheets to stick together and the machine will start pulling in multiple sheets. For this reason, glossy paper stock is not recommended for friction fed folders. If you are doing a large quantity of glossy stock on a regular basis, we recommend searching for an air fed folder instead. These can handle the glossy stock, however the price point is much, much higher, due to the technology behind them. Examine your rollers carefully for dirt, dust or buildup. A friction fed folding machines depends on the friction is creates to pick up your paper and keep it moving through the machine trouble free. If your rollers are worn smooth, or covered in dust, they may not be able to properly pick up and handle the paper. Over time the rollers can become coated in paper dust, making them less effective. We recommend cleaning them with diluted soap and water, or ideally, a rubber rejuvenator. Be sure to unplug the machine from the wall outlet before cleaning it. Do not use alcohol on your rubber rollers, as that will dry the rubber out and cause further damage. If the machine is old, you may also want to contact the manufacturer to find out if replacement rollers are available. Not all machines, especially lower cost ones, have replaceable rollers. Check the paper pick up pads at the paper feed to make sure they are not worn out. Worn out and old pads will cause your machine to pick up double sheets and misfeed. These are often replaceable. Check with the manufacturer of your machine for where to buy replacement pads. Check your socket and on/off wall switch. If the machine won't power on, after being plugged in, unplug it and plug in a different electronic device, to make sure the outlet is working. If the socket is tied to an on/off switch on the wall, make sure it is in the on position. Make sure the on/off switch on the machine is also in the one position. Check your power strip or surge suppressor, if necessary. If you are plugged into a power strip or surge suppressor make sure that it is in the on position as well. Try unplugging the unit from the power strip and plugging it directly into the wall. Check your power cord or connecting areas to be sure there is no fraying or damage to them. In the end, even with a new machine, it may simply be an electrical problem, if all of these steps don't work. DO NOT take apart the machine, as this will void the warranty. Contact the manufacturer, if the item is still under warranty, for repair or replacement. If the machine was purchased from us within the last 30 days, and it is not a "No Exchange" item, please contact us for instructions on a return and replacement. If the item is listed as "No Exchange" on the product page, or it has been longer than 30 days since your purchase, you will be sent directly to the manufacturer for repair and replacement. We strongly suggest that when you purchase a new piece of machinery you always hold on to the original product box, as we, and other retailers, often require that for an exchange. If you purchased an item from us within the last year, and need an invoice as proof of purchase for warranty work, please feel free to contact us for a copy. If you are new to paper folders, you may also want to check out our Paper Folder Buyer's Guide. Written By: Nora Kramer. �Your Office Stop, 2008.